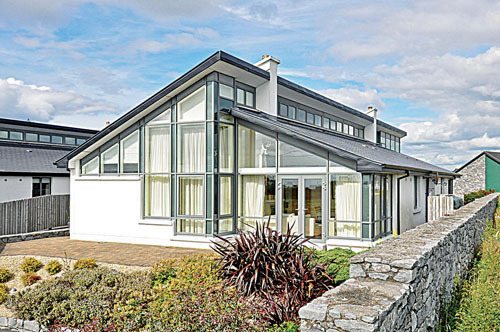 O’Donnellan & Joyce has just brought a magnificent property to the market at Lacklea, Barna. According to Colm O’Donnellan it is not often that you get the combination of a breathtaking home in a breathtaking location, but this property at Lacklea has it all. Situated just outside Barna village in a tranquil cul-de-sac, this 2,500sq ft home offers magnificent views across Galway Bay and the surrounding coastline. The house which was only recently constructed within the last five years is of a modern design by award winning architectural firm Simon J Kelly & Co, which has designed the property to maximise the views and the light. It has a breathtaking internal layout with magnificent high ceilings and a quality finish throughout, creating an outstanding home in this outstanding location. The property boasts a magnificent porch with glass doors to the front and double doors leading to an entrance hall which has a marble tiled floor with recessed lighting, a corridor which leads off the hall has double height ceilings with a row of windows facing south to the highest point in the ceiling. The lounge measures 14ft x 15ft 6” and offers spectacular views over Galway Bay; this room has double height ceilings, recessed lighting, oak floors, and double doors to a patio. The main living room is 24ft x 15ft 6” with double height sloped ceilings, recessed lighting, recessed wood gas fire, and oak floors. The kitchen/breakfast room has a marble floor with granite worktops and contains a range of Miele appliances to include washing machine, dryer, dishwasher, and wine cooler all included in the sale. There is an island in the middle of the kitchen with a granite worktop. Leading off the kitchen/dining room is a utility room which is extensively fitted. There are four large bedrooms all with built-in wardrobes and full en suites. The master bedroom, which is 11ft x 17ft, has a solid oak floor, double height ceiling, built-in wardrobes, air conditioning, and a full en suite with Jacuzzi bath, whb, and wc. Outside there is an extensive external lighting system with maintenance-free cobbled areas surrounding the property, which is enclosed by natural stone walls and accessed via electric gates with a video intercom. The property offers uninterrupted views of Barna Pier, Siliverstrand, Galway Bay, and the Clare hills. It is within minutes of all the facilities of Barna which has exceptional shops, schools, and restaurants. Asking price is €675,000. Further details can be had from Colm O’Donnellan 087 2887446 of O’Donnellan & Joyce, phone 091 564212.